Horses offer clients honest feedback through experiential learning and therapy, as they work together to process and solve life’s challenges. There is no riding involved. 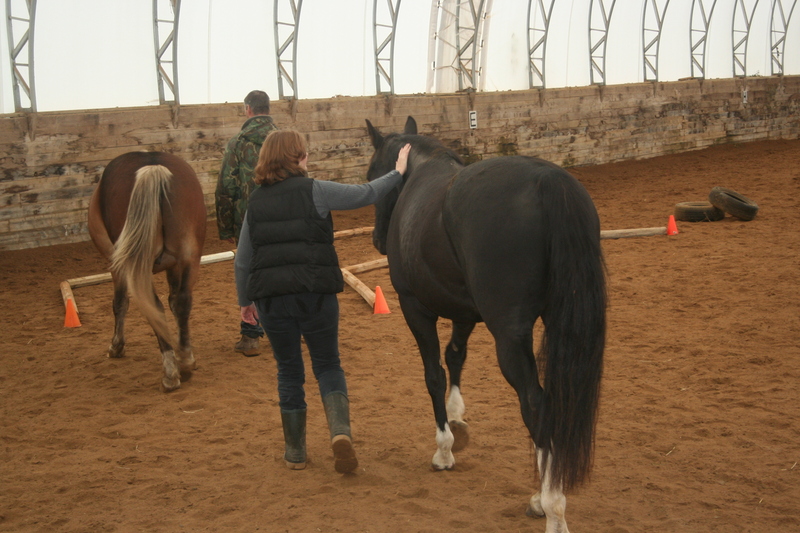 The client (s) works with the horses face to face on the ground under the supervision of the wellness team, consisting of a mental health professional and an equine specialist. Horses offer as powerful metaphors representing the different obstacles and opportunities that clients face in their daily lives. Working with an 1100 pound horse, a herd animal, whose instinctual nature gives them the ability to read and react to the emotions around them gives the client the opportunity to practice new coping skills with an experience that is real and life changing. Charmed Horse Assisted Wellness Centre is located at 578 Brown Road, Enterprise, Ontario providing a close commute to Kingston, Trenton and the surrounding areas. Our programs and sessions are customized to each individual and or group, maximizing the benefit to the client(s). This form of experiential learning and therapy aids in the healing and development of coping skills for numerous physical and mental limitations, such as, but not limited to: ADD/ADHD, anxiety, autism, bereavement, depression, eating disorders, low self-esteem, PTSD, as well as those who want to experience self-discovery / spiritual growth, and a stronger connection within their family and work lives.